I enjoyed this movie. I am going tomorrow to watch this movie again. This is no superhero movie just a wannabe. Only a comedy for small children. This movie was very funny. Who cares if was not for adults. Excellent movie. I can’t wait to watch the sequel. Funny comedy of a super hero with the heart of a teenager. I loved how he united with his fosters brothers and sisters. Ok for little children but this is no suoer hero movie. Just a mediocre boring comedy. Such a fun movie, very entertainning! surprise it only made approx. 250M so far, what are you waiting people, go see it. I would go see all the Marvel and DC movies at the box office, if you are not, than you are not a true movie fan. Faithfully adapted from the most popular comic super hero of all time. During the Golden Age this Captain Marvel was number one and Superman was number two and I have to say this movie surpasses all other super hero movies. A very fun movie. I really enjoyed it. What a ride! Here's hoping there's a SHAZAM! cameo in the upcoming Joker movie. There is only one word to describe this movie: FUN! And it has tons of laughs, action, and some drama too. Those kids were very good actors. All in all, this movie is why we got to movie theaters. I went to this moving thinking it would be ok, but boy I was wrong. Shazam is a great feel good and fun movie. I left the theatre laughing and so glad I went. A must see for any kid, and any adult with that kid sitill inside. Finally DC gets one right, and Marvel is beginning to tank. For die hard comic book fans, Captain Marvel is still Billy Batson, I hope after this, Aquaman, and Wonder Woman, DC sees the value in original comic book storylines, not every superhero is the dark knight. Thoroughly enjoyed the movie! Glad they decided to only do one Origin story in this movie and save Black Adam for another film. Casting was great and the effects were fantastic. Great to see that DC has taken a turn for the better and now are focusing more on the story. This movie is definitely worth watching on the big screen! This movie was great! The action scenes were intense, and the loving scenes with the family message was easliy delivered. It melts your heart then makes you laugh all at the same time. But there is a dark sense to it too that surprised me. A light hearted comedy. A good time waster. Just turn off your brain and you will be fine. Real Captain Marvel nailed the Box Office. Stayed truthful to the source material and its colorful. Adopted the source from the classic golden age DC and bit from new 52. Shazam Family story line was adapted from Shazam Family Prime Earth. A great movie if your 10 years old. We liked this comedy movie. GREAT ACTION SUPER HEROES COMEDY HEARTFUL STORY. ?? LOVE SOOO MUCH SHAZAM! ?? ?????? Just fantastic. We had a blast watching this movie. This was a super comedy hero. Please don’t bring little ones to this movie. The demons attack in the office was too graphic. Anything was fine. It was great! I don’t suggest it for little kids though. Lots of language and older humor. Otherwise, AWESOME! Ok for a children's show but not exciting like the really good super hero movies that adults and older teens like. Interesting movie. Better than the original TV series that I never watched too much in YouTube. I had a good time watching this fun movie. 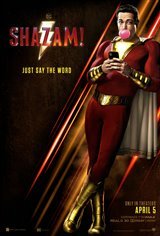 I did not like this movie at all, Billy who was Shazam was never at his friend Freddie's side as Shazam, I do not know why this movie would show the Freddie character being bullied, did not understand the motive of this movie. Did not like this movie at all! Heroes don’t need to be blue and sad. This movie found the perfect balance between a good super hero and a good comedy in the background.